From the needs assessment to the installation, we cover each step of the process; conception, permit application, installation and maintenance. Whether for a national image change or a single site, a qualified person will be assigned to you. Your personal representative will highlight your needs and answer your questions. He or she will relay the information between you and our team while providing you with sound advice. Finally, he or she will ensure cooperation of all parties in order to meet the deadlines. Thus you will be able to follow your project throughout the process. 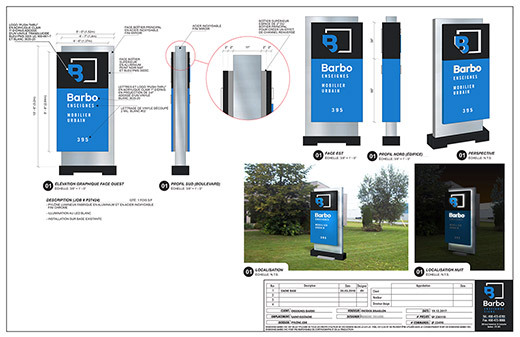 After analyzing your needs, we will create a customized sign project reflecting your corporate image and your budget. At this stage, the materials will be selected and may vary depending on the nature of the project. However, the quality of the finished product remains at the forefront of our concerns and this key aspect has made our reputation over the years. At the end of this process, presentation drawings will be sent to you for pre-production approval. These will also be used for approvals from the city and/or the building owner. 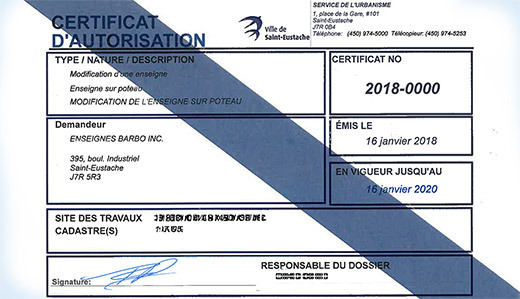 Furthermore, when required, an engineer seal may be obtained depending on the province or territory concerned, for approval of our technical plans. 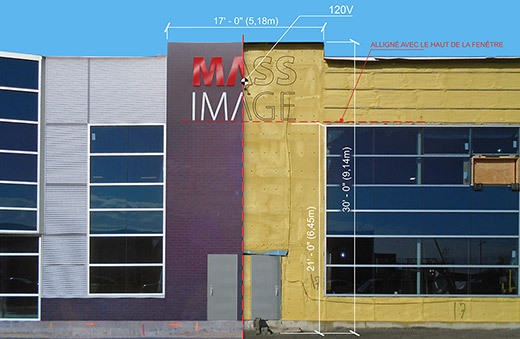 The intent of a site survey is to take pictures and measurements of the future site for the placement of signage on buildings, or in and around the building property. 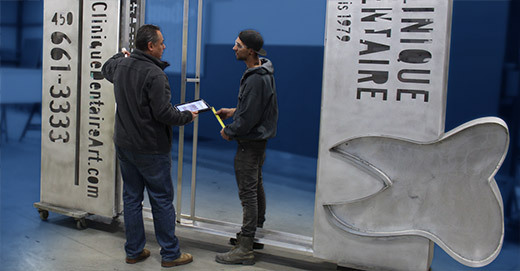 This step is essential in order to allow complete manufacturing estimate and to avoid any problems during installation. It will later allow us to present you with a visual presentation of the final product. Should you choose this service, we will check the current relevant municipal regulations on your behalf in order to advise you, and then we will present you with a suitable sign project. Finally, we will apply for a permit upon your approval of the visual rendering. Upon receipt of your approval, our drafters will put their skills at work to develop technical specifications that will be directing our production team throughout the manufacturing process. This step is the core of the project. Indeed, manufacturing requires the simultaneous participation of several members of our team in order to build high-quality signs having the desired visual impact. It is also at this crucial stage that installation methods will be planned so that they go smoothly. 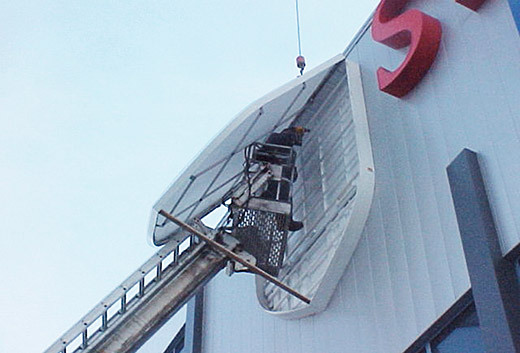 We are capable of installing your signs anywhere in Canada due to our team of qualified signs technicians and installers. Also, we have developed a privileged relationship that we maintain with a network of qualified installers from coast to coast which allows us to offer prompt service at a competitive price. We have the manpower, vehicles and equipment needed to respond in a timely and cost-effective manner to service calls you place at our offices. Our experienced technicians will be able to identify and repair problems that occur on your signs worn over time, or damaged by the weather or vandalism. One of the following services appeals to you, but you would like to get further details about how they work? We will be happy to answer all your questions and guide you towards what best suits your business needs.